On Earth the road never ends. From tarmac to trail, every ride is an escape into freedom. 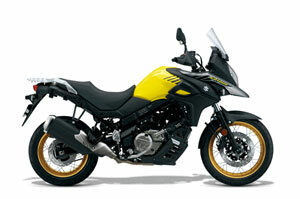 The all-new go-anywhere V-Strom 650XT (Cross-Touring) is ready to expand your field in adventure touring. The Learner Approved variants 645cc V-Twin engine output is restricted to 35kW to meet the Learner Approved Motorcycle Scheme (LAMS) requirements and offers exceptional low-to-mid rpm performance.^^The XT Cross-Touring variant comes fitted with wire spoked wheels, hand gaurds and engine under cowling as standard.^^Offer ends 30/04/19^^*Ride away price includes all offers, cashback, rebates and discounts.